Sweeping is one of the most ancient forms of cleaning floors that is still in use today. Sand, dirt, and dust are a part of everyday life and it needs constant attention. Sweeping is a simple and efficient means of getting rid of that debris from almost any type of surface. Why is sweeping important? A dirty floor is unattractive. A dirty floor can be dangerous and could cause someone to slip and fall. Dirt and debris can cause a floor to wear faster than normal. When there is less dirt on the floor, there will be less dust in the air. Today, there are much more sophisticated ways to sweep compared to using a broom or brush. For instance, there are mechanical sweepers. These can range from small walk-behind sweepers, to large riding sweepers. When choosing a sweeper for your application, there are a few factors to be considered. 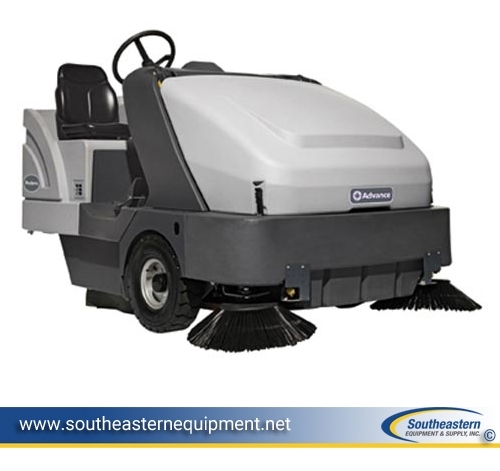 Most sweepers work by combining a mechanical sweeper with a powerful vacuum system. The motor rotates the main sweeper brush in the opposite direction of travel which then throws debris into a hopper. A vacuum system assists by sucking air over the brush, then through the hopper and out into the atmosphere. The hopper is typically placed in the rear of the machine and debris enters through the top. This placement ensures the hopper is used in the most efficient manner, thus increasing cleaning performance and productivity. Think about where you are going to dump your hopper. If the dump area is not easily accessible, think about getting a sweeper with a large hopper to decrease excessive dump trips. If you will be sweeping indoors, look for sweepers with effective dust control systems. This will ensure dust is kept at a minimum. Getting the right size sweeper is key. If you use a sweeper that is too small for your cleaning area, you will end up spending more money in labor costs. If your sweeper is too big, you may not be able to clean in those tight spots. Some companies may choose to have both a large rider and a small walk-behind sweeper at their facility. Since sweepers can’t be plugged into the wall, a portable power source is needed. The two main power system options available for floor sweepers include engine and battery powered systems. An internal combustion engine is a good option if you don’t want to lose any productivity time. If you are using an engine that takes LP(Propane), the sweeper can be used indoors or outdoors. However, operating costs can be significantly higher than a battery sweeper if you consider the cost of fuel and preventative maintenance. Battery sweepers are ideal for indoor applications and your consumable costs will be considerably less than an engine sweeper. Battery sweepers will need at least 8 hours to charge; This means 8 hours of downtime. Walk-behind sweepers will be easy to maneuver in tight places. Less expensive than large rider sweepers. They are much more productive that the traditional broom. These sweepers will be low in productivity compared to the larger rider sweepers. They will also have manual dumping for the hoppers which could lead to workplace injuries. The dust hopper can get very heavy. Operator fatigue will come into play since they must walk-behind the machine. These machines are meant for high productivity with their wide sweep paths and large hoppers. The operators will be able to work a full shift since they are riding. These large riding machines will often have an automatic dumping system. The riding machines are generally more expensive but it may be justified if productivity is increased. The machines may have problems in tight areas. A large area is needed for storage and charging. Also available is the rider sweeper-scrubber. It has both a complete sweeper system along with a complete scrubbing system. The sweeper system is usually in the front of the machine and the scrubbing system is at the rear. These power-houses can sweep and scrub simultaneously, therefore drastically improving your productivity. The sweeper-scrubber can also use both systems separately. While the cost of these combination machines will be higher, this is usually offset by accounting for the amount of labor and time saved. The automatic sweeper is a huge leap in floor cleaning compared to the traditional broom and dust pan. 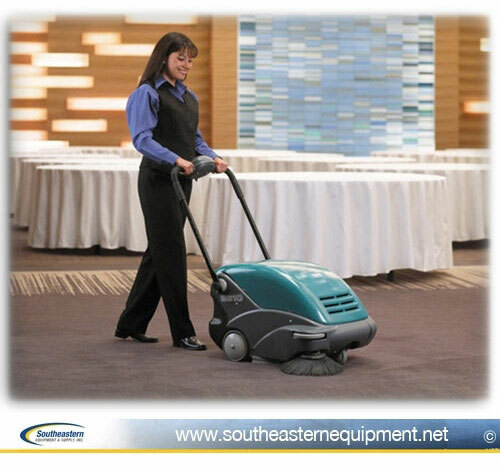 An automatic sweeper will control dust, increase floor lifespan and reduce labor costs. There are a wide variety of walk-behind and rider sweepers available. If you have any questions or would like to have one of our industry professionals provide you a professional recommendation, please call us at 800-440-6723.